Many Go positions chill to numbers in combinatorial game theory (CGT). Conventionally, we just call them numbers. If there are no kos involved, it's never optimal to play in a number instead of a hotter play, and it is never wrong to play in the hotter of two numbers. With no kos involved, Go numbers always have a power of 2 in the denominator. The ones with larger denominators are hotter; play in them has a miai value of 1 - 1/D, where D is the denominator. 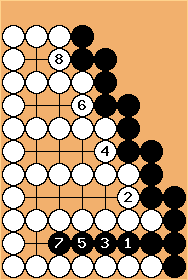 a is worth -1/2 (1/2 point for White). b is worth -1 1/4. e is worth -4 1/32. The whole thing, their sum, is worth -10 31/32. 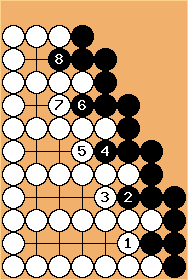 In the play of numbers (without ko) the player with the move (sente) can "round the number" to the nearest integer in his direction. 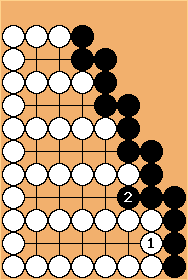 Here Black to play can play to -10, White can play to -11. Well, the rest is miai. had a miai value of 31/32. -10 31/32 + 31/32 = -10. Since that is an integer, neither player needs to play, and the result will be the same (with correct play), regardless of who plays first. Of course, it will be played out before counting, but that is a formality. -10 31/32 - 31/32 = -11 15/16. -11 15/16 + 15/16 = -11. This position is the same as the previous one, worth -11. 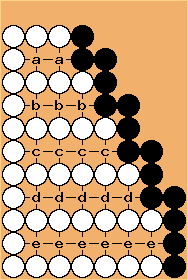 Black's mistake of 1/32 point ended up costing a full point, because it allowed White to round down to -11. Scary! This is also a number, as you may verify. If that's not clear, see another number.